Today’s projectors are subjected to more than ‘normal’ indoor dustparticles. Events can take place in large venues or outdoors where equipment can be exposed to dust, dirt and sand, as well as fog, smoke, hazers and pyrotechnics. Fog juice filters are designed to reduce the affects of the oil or juice created by these special effects. 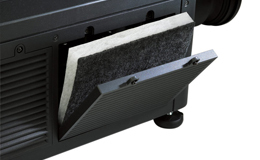 Each M Series projector is designed to operate filter-free, but is equipped with two removable side panels that are designed to hold a filter, if required. Additional mounting equipment is not required. The Fog Juice Filter Pack M Series is suitable for all projectors in the M Series.